The other day, a friend wanted to share with me a delicious loose tea he’d bought in Chinatown recently, but neither of us had a tea infuser handy. Tea infusers (like the one in the picture) are those little mesh balls that open up so you can put the tea leaves inside. Then you put the whole thing down in your hot water like you would a tea bag, and let it brew. 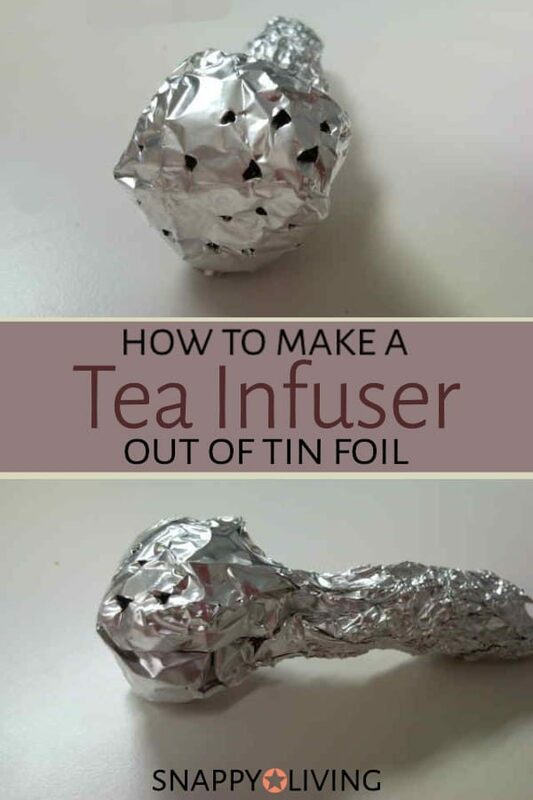 It turns out you can make a tea infuser out of tin foil. So what do you do when someone’s tempting you with the yummiest tea he’s ever tried, claiming it’s even better than the $1500/pound tea he sampled at the tea bar in San Francisco, and you don’t have a strainer? Cut a piece of tin foil about one foot square. Fold it twice (to one-quarter the original size). Bring the corners of the tin foil together above the leaves, then twist and fold them. You’ll end up with what looks like a tin foil ball on the end of a tin foil stick, with the leaves inside the “ball” and the stick as a makeshift handle. When you’re ready to brew, poke about 10-12 holes in the tin foil “ball” with a toothpick, fork tine or something similar. Put the tin foil ball into your mug. Pour boiling water over it, letting the water soak through the strainer as much as possible. Let it brew for the correct amount of time for the tea you’re making. The packaging should give you some idea. Generally, loose teas take less time to brew than teas in a bag. Remember, the tin foil infuser can get pretty hot to the touch by the time it’s done brewing. I didn’t feel it came close to burning my fingers or anything, but with hot things, it never hurts to be careul. And yes, if you’re wondering, the tea my friend shared with me was amazing. It was a lychee black tea, and we used a special brewing method for it: put the makeshift infuser in a mug, pour in enough hot water to cover the tin foil ball, leave it for maybe five seconds, then pour that out. Then we poured the full amount of water into the mug and let the tea brew for about twenty seconds. With this particular tea, you can do this five more times with the same teaspoon of tea to make five cups before it will lose its flavor. This made for a golden, slightly floral, slightly sweet tea that didn’t need anything added to it – it reminded me of really good oolong tea, only better. Seriously, it was one of the most delicious things I’ve ever tasted. This is indeed ingenious. But you don’t need an infuser to brew loose tea. The very best pot of tea is made with leaves left completely loose — no infuser needed. It’s the traditional English way of brewing a nice cuppa. It’s also the origin of tea-leaf reading — you need those few escaped loose leaves in your cup to make it work. You do need a teapot — you could use a glass or ceramic canister or jar just as easily. Warm the pot (I usually use hot tap water), measure the loose tea into it, pour in the water when it boils, stir it a few times, then leave it alone to steep for the required number of minutes. The leaves will sink to the bottom of the pot. Then you pour it slowly into your drinking utensils — if you do it gently, you’ll get very few leaves in your cup. Or if you have a fine-mesh strainer in your cupboards, or a finely-woven basket, pour it through that. Actually, “tea strainer” is the name of the fine metal or bamboo cup-sized sieve used to catch the leaves when you pour loosed-brewed tea into a cup. If there’s still tea in the pot after you fill the cups, you can either wrap the pot in a cozy (anything that will help it stay warm) if you’ll be pouring the second cups soon, or decant it off into another container if you’ll be taking your time. To clean the pot, you can either fill it with cold water, swirl it around to pick up all the leaves, and pour it out through something that will strain the leaves from the water — even a dishcloth will do the job — or you can do what I usually do, wait til it’s cool and wipe the leaves out of the pot with a paper towel. Actually, “tea strainer” is the name of the fine metal or bamboo cup-sized sieve used to catch the leaves when you pour loosed-brewed tea into a cup. That’s what I thought, but yesterday when I checked search engines to make sure that was the right term, they showed far more pictures of this device as “tea strainers” than tea infusers, so I thought maybe “strainer” was what most people called it, whether that’s correct or not. I made a few changes in the article now. Thanks so much for sharing. Great idea. That method that you used is used in the ancient Chinese tea ceremony. I use it all the time while preforming the ceremony with friends and I do agree that it makes tea better. That’s fascinating! Thank you for sharing that, Jemma. Wondering if aluminium foil in hot water is good for health. Kindly help me out. Thanks!